It’s been one cheating rumor after another for Chinese actor Chen Sicheng (陈思诚). Divorce speculations with his wife Tong Liya (佟丽娅) are becoming more likely. A few days ago, a Chinese netizen spotted Chen Sicheng with two women at an Asian restaurant in Los Angeles. 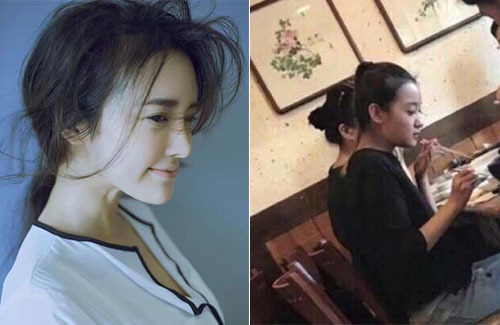 The netizen claimed that Sicheng and one of the women, allegedly actress Zhang Xuan (张璇) referred to each other as “bao bao” (baby) throughout their lunch. Though they were eating with other friends at the time, Sicheng and “Zhang Xuan” interacted like a couple. The netizen shared the photo on line, which intensified Sicheng’s lingering cheating rumors. Zhang Xuan’s background was also dug up—the 28-year-old actress is an alumna of the Beijing Film Academy, and lived in the same dormitory as Yang Mi (杨幂) and Yuan Shanshan (袁姍姍). However, Zhang Xuan’s career never took off as well as her dormmates. This was not the first time that Chen Sicheng faced cheating rumors. Around his marriage to Liya in early 2014, Sicheng was spotted spending two hours at another woman’s home. This incident was not revealed until months after Sicheng and Liya’s marriage. Liya had defended her husband at the time. Earlier this year, Sicheng was caught meeting up with two women in his hotel room; the trio stayed in the room all night. Zhang Xuan has since denied dating Sicheng. She clarified that the woman in the photo was not her, and uploaded a photo of her own profile for the netizens to compare the difference.